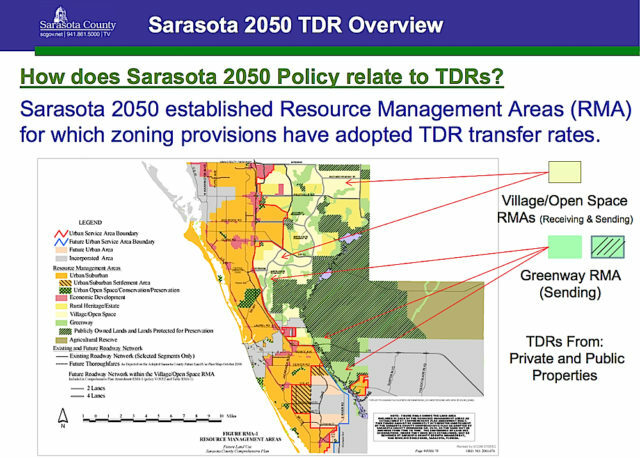 In an effort to spur the construction of more affordable housing in the community, the Sarasota County Commission has asked its staff to look into how transfers of development rights (TDRs) in its 2050 Plan — which governs development east of Interstate 75 — could be used as incentives for such homes. The action came on April 27 as the board also voted unanimously to eliminate a low price for the initial TDRs purchased for a project — a policy set in 2013 to help prod 2050 developments. The affordable housing idea came to her as “one of those ‘Ah hah’ moments,” Commissioner Christine Robinson told her colleagues. Robinson noted that the 2050 Plan already calls for a certain percentage of such units, but the TDR pricing could be used to encourage developers to create more of them. Parsons explained that 15 percent of the total number of dwelling units in a 2050 Plan community have to be affordable. Ten percent of the 15 percent must be for people making 80 percent of the area’s median income, or less; the remaining 5 percent of the 15 percent have to be set aside for those making 100 percent or less of the area’s median income. Robinson suggested that a TDR bargain of some sort be offered to developers proposing to exceed that 15-percent level. Parsons explained that TDRs can be applied to multi-family dwellings as well as to single-family units. As for other TDRs: The fee the board set on April 27 will represent 10 percent of the median price of houses sold in the county in June. That month typically has the highest sales prices every year, Parsons explained as the reasoning behind that decision. In June 2015, for example, the median value was $230,000, so one TDR would cost $23,000. However, commissioners left open the opportunity to negotiate prices depending upon deals offered by individual developers. As Parsons explained during the board’s regular meeting on April 27, a TDR is the right to build one housing unit. The goal is to protect environmentally sensitive lands and other open space by allowing denser developments through the sales of TDRs, he pointed out. A TDR can be sold from property the county already has set aside to be protected, or it can be sold from within a 2050 Plan site, to allow for more open space in that project, Parsons told the board. Across the United States, Parsons continued, TDRs primarily come from private property. 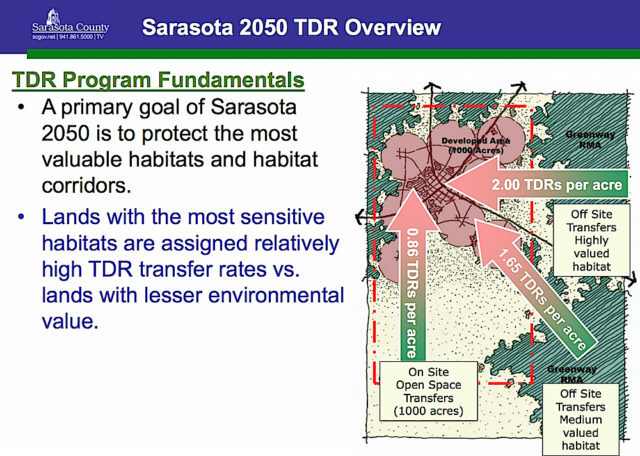 And the commissioners made it clear during their discussion that they would much prefer the private sales of TDRs within Sarasota County. “I don’t think any of us want to be competing with the private sector,” board Chair Al Maio said. After a concern arose in March about the use of proceeds from certain types of county TDR sales, Parsons noted on April 27, staff talked with the county’s bond counsel to clarify a point. “The situation isn’t quite as dire as staff presented it [then],” Parsons explained. 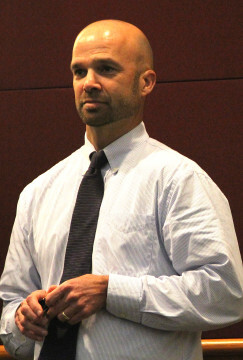 During that March discussion, Parsons told the board that a communication from the bond counsel indicated that the proceeds from selling TDRs on property the county had purchased with bond revenue would have to be used to buy new property within two years and that none of the funds could be used for maintenance of property in the county’s Environmentally Sensitive Lands Protection Program (ESLPP). Yet, most of the property the county has purchased in the ESLPP has been paid for with bond revenue, he said. Parsons reminded the board that in 2013, the county commissioners decided to price TDRs at a lower level than a financial analysis had justified as a means of spurring 2050 development. They set the fee for each of the first 100 TDRs at $4,462.50. Any additional TDRs would cost approximately 7.5 percent of the June 2012 median house sales price, which worked out to $13,167, he added. In September 2015, Parsons continued, the board entertained offers from two different developers, both of whom asked for the lower price for the first group of TDRs each purchased. One of those planned on buying up to 276 more TDRs, while the other was seeking a total of 80. The board also kept the base level of 7.5 percent of the June 2012 median sales price of a house for the deal involving more than 100 TDRs, he noted. However, as a means of encouraging that developer to proceed as soon as possible with the project, the commissioners agreed to a 3-percent escalation of cost for subsequent TDR sales to that developer, Parsons reminded the commissioners. 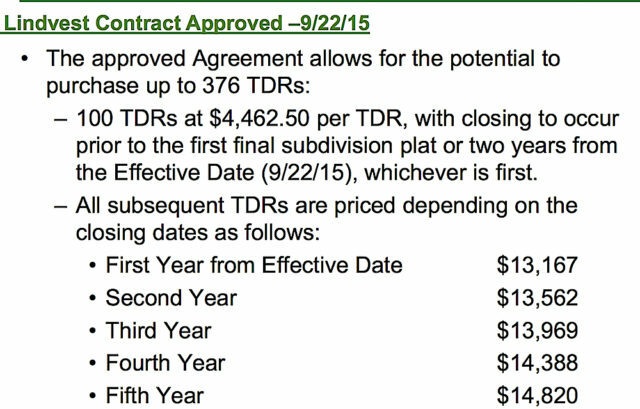 By the fifth year, the price of a TDR would be $14,820. Parsons told the board that county staff closed on the first 100 TDRs of that proposal the previous week, with the approximately $450,000 in proceeds set aside for new land acquisitions. Closings on TDRs “require a fairly significant amount of staff overhead,” he pointed out, including time investments of representatives from the Office of the County Attorney and the Office of Financial Management. Therefore, staff recommended the board keep an escalator in whatever pricing policy it set, to encourage developers to pursue closings as soon as possible, Parsons continued. Staff suggested a maximum of five years for any deal involving more than 100 TDRs, Parsons said, with the number of closings limited to five. For transactions with fewer than 100 TDRs, he told the board, staff recommended limits of two years and no more than two closings. Both deals would keep the 3-percent escalator. Yet another offer to purchase TDRs came to staff in November 2015, Parsons told the board. That buyer wants to purchase 42 TDRs at the $4,462.50 price, he added. Chair Maio characterized the lower-priced TDRs as a “more, sooner, cheaper” strategy to encourage developers to pursue 2050 Plan communities several years ago. Deputy County Attorney Alan Roddy advised the board that it always can negotiate the exact price of TDRs when it has an offer on the table, regardless of the policy it set. Hines likened TDR transactions to those in which an individual has had his home appraised and has put it on the market. If someone proposes a cash deal with a lower price than the homeowner has set, Hines said, the seller might find the offer attractive enough to take it. Hines also told his colleagues, “We want the private sector to sell [their TDRs] because that protects property that’s not currently protected.” If the county sells TDRs, those come from land where development already has been prohibited, he added. 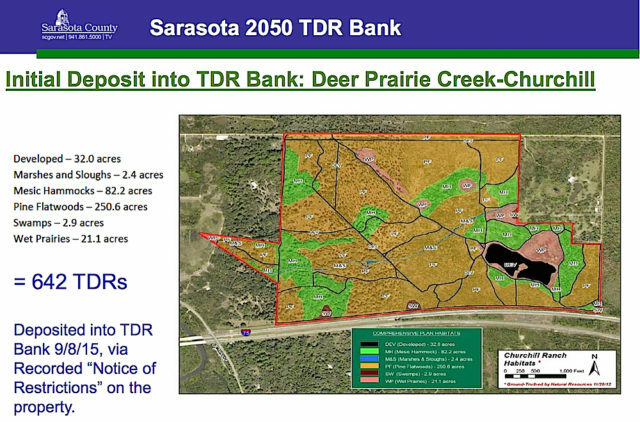 However, if the county does sell TDRs, he continued, the funds will go toward protecting more land. Commissioner Carolyn Mason suggested the board move sequentially through the list of staff recommendations Parsons had proposed. As a result, the board unanimously set the fee for a TDR at 10 percent of the median price of houses sold in June each year. It also unanimously agreed to limit terms to a maximum of five years and five closings for deals involving more than 100 TDR transactions; and for those with fewer than 100, a limit of two years and two closings. Both sets of transactions would include the 3-percent escalator. They also voted unanimously to eliminate further transactions in which the first 100 TDRs would be offered at $4,462.50 each. Then Robinson made her motion asking staff to research reduced-price TDRs to encourage more affordable housing. “Thanks for bringing that up,” Hines told her.